ad Cop isn't a band that shies away from the possibility of insanity; it's a notion that's been flowing through Adam Anyone's veins since he was a kid. Adam was dedicated to music at an early age and has been playing with numerous bands in the nashville scene since he was 12 years old. He drew his creativity and musical influences come from bands like The Doors, The MC5, Joy Division, & Nirvana. At age 15, Adam was sent to Hidden Lake Institution against his will, where he wrote "I'm in Lust with You," the bands dirty love song. After being released, he started writing music with Alex Hartness and they were pumping out material fast. Bad Cop was formed and Adam was so motivated, he dropped out of school to pursue music full time. 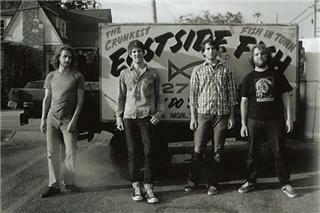 In 2009, Bad Cop recorded a demo at Battle Tape Recording, and soon after were picked up by the infamous label ROIR, who released their debut record Harvest the Beast in September 2010. While receiving critical acclaim, and touring across the country, there were internal issues within the band that forced them to restructure. Not wasting time or being discouraged, Adam Anyone launched his own record label Jeffery Drag Records while continuing to write new material and putting the band back together. The autonomous label has put out releases by acts like Pujol, Natural Child,Turbo Fruits and more. Bad Cop's second release came at the end of 2011, appropriately titled, I Can't Slow Down. The EP was well received and caught the attention of a band called Cage the Elephant who consequently brought them on as direct support for a run of their 2012 national tour. Not only did Bad Cop receive an amazing platform to display their art, Brad Schultz (guitarist from Cage the Elephant) is now in the studio producing Bad Cop's new EP due for release at the end of year.